Considering a HotWired jacket liner. My old Eclipse electric vest and battery charger both have a male BMW plug that plugs into a (female) BMW outlet wired to the battery on my 12S. 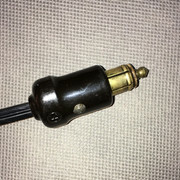 The HotWired jacket has a small 1/2"round plug that I would like to convert to the BMW plug so I can plug it into the existing (female) BMW outlet on my bike. Would it be difficult or risky to splice the BMW plug into the new HotWired wires so I can just plug it in to the BMW (female) outlet? Maybe check out this adapter - https://www.warmnsafe.com/collections/accessories-cables/products/bmw-plug-to-coax-jack-18-inch-adapter-cable. I think that's it! Thanks a million. ....or, the BMW male plugs are quite easy to attach directly to two-lead wires.